You have to fill up and submit two forms as part of the application procedure. Read the sections below to know more about the application forms. The first step in the application procedure is to apply for the OPENMAT entrance exam. The application to OPENMAT entrance exam is completely online through IGNOU website. Now you can submit the application for OPENMAT exam ONLY via IGNOU website online. All the fields are easily understandable from the field names, with the exception of fields 1, 2 and 3. Here you have to select Regional Center nearest to you. The list containing the regional centers and their contact information is given in the Student Hand Book and Prospectus. The list of IGNOU Regional Centers is also available here. Select the Study Center most convenient for you to attend. Please note that this is the center where you will be required to attend the counselling sessions for your courses as well as attend the exams for the courses. The Entrance Test Center allotted however, may not necessarily be the same as the Study Center of your choice. The list of study centers can be found in the Appendix 3 of the Prospectus and Student Handbook. After you choose the Study Center, then you have to enter the Code corresponding to the Study Center in the field 2 of the application form. In this field you have to enter the code corresponding to the State of your residence. The State Codes can be found in the Appendix 4 of the Prospectus. The rest of the fields are easy to fill and easily understandable. Please take care to provide the correct details, otherwise the application forms would be rejected by IGNOU. Make sure that the application form is submitted before the last date for submitting online application. After you have qualified in the entrance exam, you can apply for admission for Distance MBA from IGNOU. For applying for admission you have to use FORM 2 available with the prospectus. The Application form looks like the following. 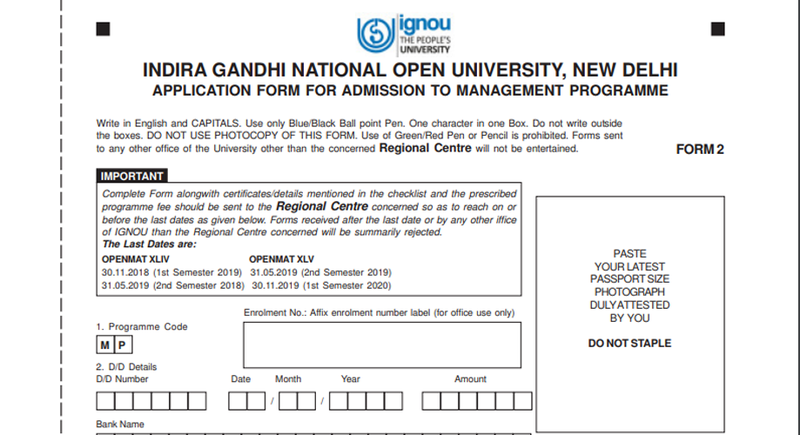 Almost all the details to be filled in the IGNOU MBA admission application form is easy to understand. The details of the fields which might confuse some applicants are given below. This is the code for the Study Center from which you would like to attend counselling sessions and other learning activities. This center must be selected in such a way that it is easy for you to attend the weekend counselling sessions on the scheduled dates. The codes for the Study Centers are given in the Appendix 3 of the Prospectus. We have also compiled the list of study centers here. This is the code for the Regional Center under which your Study Center is functioning. This is the place where you would be submitting your Admission Application Form, Course Fee and other Documents. The list of the Regional Centers along with their codes are available in the Appendix 2 of the prospectus. Given below is the checklist of important documents to be attached along with the admission application form for MBA. Please Note: The formats for the Category Certificate and Experience Certificate is available in the Prospectus. The filled in admission application form (Form 2) along with the documents and the course Fee must be sent ONLY to the Regional Center selected by you. The adresses of the Regional Centers are available here along with the Regional Center Codes.